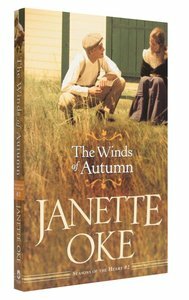 About "The Winds of Autumn (#02 in Seasons Of The Heart Series)"
Janette Oke was born in Champion, Alberta, Canada, during the depression years. She graduated from Mountain View Bible College in Alberta where she met her husband, Edward. They married in 1957 and served in churches in Calgary and Edmonton, Canada, and Indiana. Oke writes historical novels which portray the lives of early North American settlers from many walks of life and geographical settings. She also writes engaging children's stories and inspiring gift books that warm the heart. Oke published her first book, Love Comes Softly, in 1979. This book experienced immediate success and became a series. She has won a number of awards including the Gold Medallion Award, The Christy Award of Excellence, the 1992 Presidents Award for her significant contribution to the category of Christian fiction from the Evangelical Christian Publishers Association, and in 1999, the Life Impact Award from the Christian Booksellers Association International. Her books have been translated into fourteen languages. Oke has published some 75 books including, The Canadian West, Seasons of the Heart and Women of the West. Her most recent releases include a beautiful childrens picture book, I Wonder...Did Jesus Have a Pet Lamb and The Songs of Acadia series, co-written with T. Davis Bunn. - Publisher.